LIUMINYING VILLAGE, China — Four men in traditional yellow costumes bang large drums to announce the start of the New Year's Eve banquet in Liuminying village. Inside the meeting hall, 100 tables are set with a dozen plates, bearing sausages, nuts and fruit. 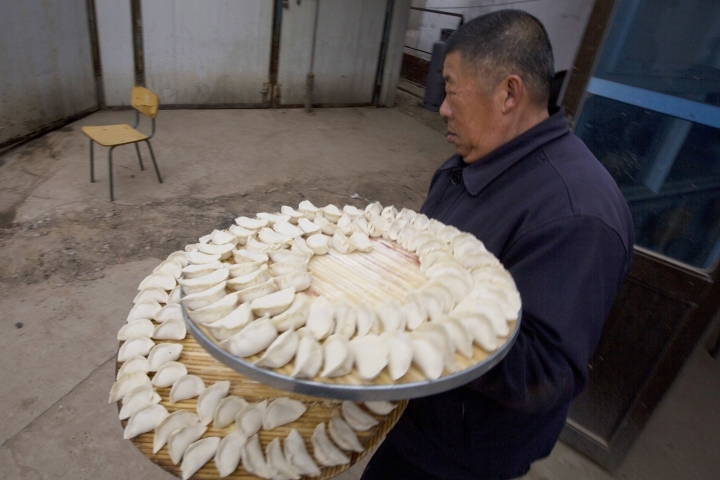 Sitting in a storage shed outside are thousands of half-moon shaped dumplings, made by hand the day before, ready to be boiled and served. 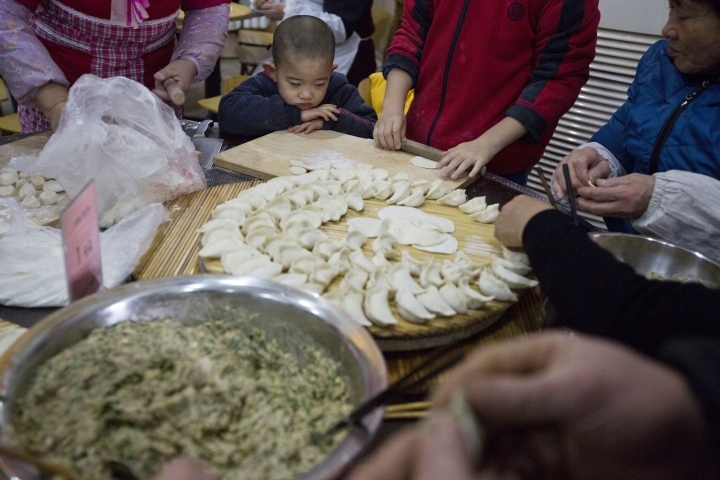 Villages and cities across China are preparing this weekend to celebrate Lunar New Year, though few feasts are as elaborate as the one in Liuminying, a hamlet in Beijing's suburbs. Festivities in recent years have been more muted as China's economy has slowed down — hitting its lowest level of growth in three decades last year — and its top political leadership has issued calls for austerity. 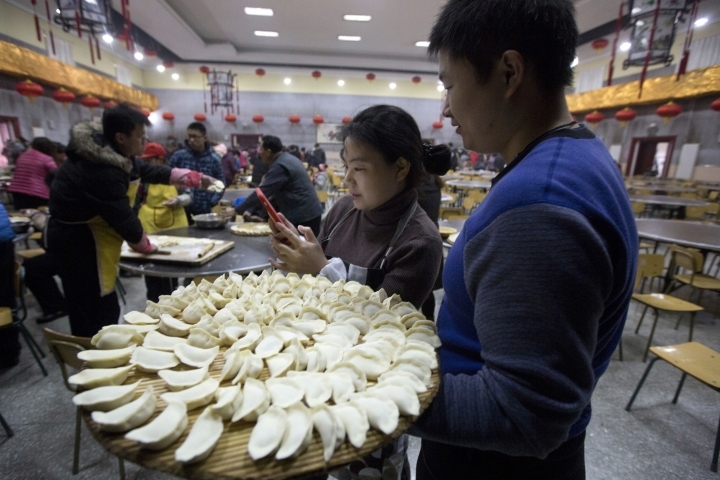 But in Liuminying, what began as a small lunch sponsored by the local Communist Party branch in 1980 has grown into a feast that served 1,000 people this year during a three-hour spectacle with singing and dancing. The show began at 10 a.m. with loud music and applause. A group of children waved pompoms in a synchronized dance, followed by a raffle, the presentation of a large banner commemorating the New Year, and several other songs and speeches. As the performances grew longer, the attendees started to peel oranges and crack open nuts. 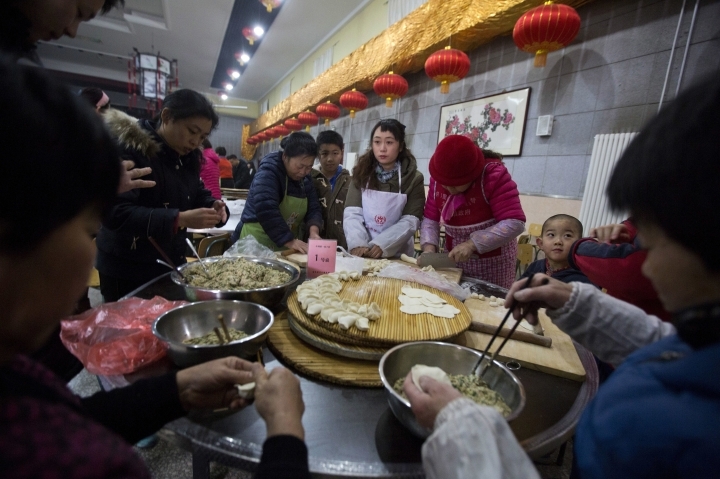 A few people smoked cigarettes at their tables, a sight not often seen in Beijing restaurants since the city enacted an indoor smoking ban two years ago. Outside, dozens of workers were preparing meat and vegetable stews in huge grills. One worker pushed coal underneath several of the grills, causing large flames to come bursting out. A few hours after the doors opened, the first dishes were brought inside. The plastic wrap came off many of the plates on the table. Diners uncorked wine bottles and, at a few tables, opened red boxes placed at the center. Inside were clear bottles of the Chinese grain liquor called baijiu, passed around for a series of toasts. 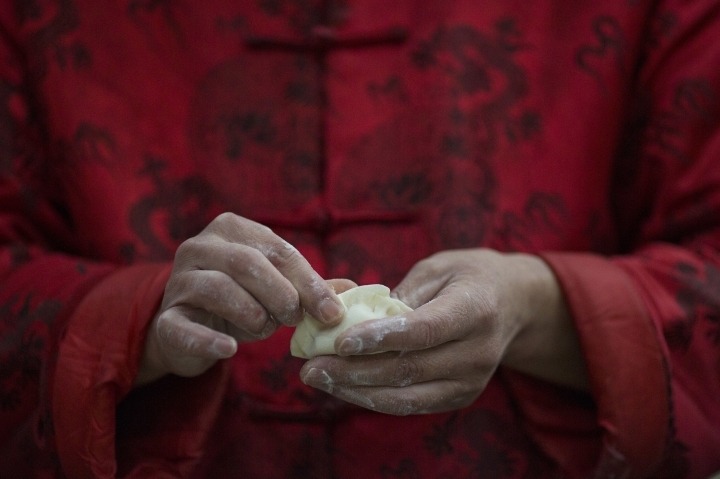 After several dishes came the signature item: the dumplings, or jiaozi, which people across northern China consider a mandatory part of celebrating the New Year. The feast ended with diners stacking their plates and bowls in a clatter that steadily grew louder as more people began to leave. They walked outside to the loud, echoing sounds of booms from fireworks, another Lunar New Year tradition. While authorities in Beijing have cracked down on the sales of fireworks, Liuminying is far enough outside for vendors to be more easily found. The sky was clear blue, offering a rare respite from the smog that blankets northern China in winter. 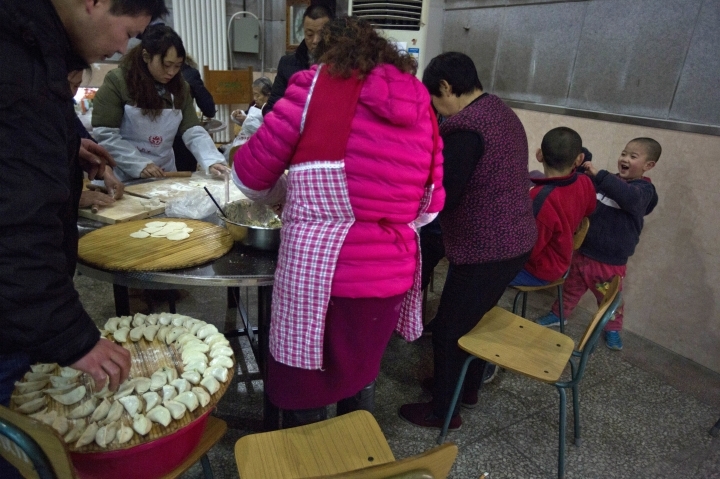 Guo Lianhong, 55, attended her first lunch in 1984 and described the "earth-shaking changes" she's seen in her village in the last three decades. "We hope Liuminying can become even more prosperous," she said. Associated Press reporter Helene Franchineau and researcher Henry Hou contributed to this report.